Deschutes Brewery in Oregon has bottled a beer otherwise known “Super Jubel” for the first time in 10 years, with Jubel 2010 set to reach store shelves soon. Deschutes usually sells the beer only at its pubs around the holidays, previously bottling Jubel 2000. A limited amount of Jubel 2010 will be available in 22 ounce wax-dipped bottles and on draft all over the west. The beer contains 10% alcohol by volume. – To celebrate the release of Top Sail Bourbon Barrel Porter Oregon’s Full Sail Brewing will host two horizontal tastings next week. 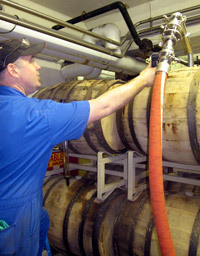 The imperial porter (9.85% abv, IBU 65) was brewed in February 2009 and aged almost a year in bourbon casks from Maker’s Mark, Stranahan’s and Four Roses. we kegged off a very small stash of each variety for the release,” said executive brewmaster Jamie Emmerson. The special tappings are set for 5 p.m. Monday at Full Sail’s River place brewery in Portland and Feb. 4 at the Full Sail Tasting Room and Pub in Hood River.